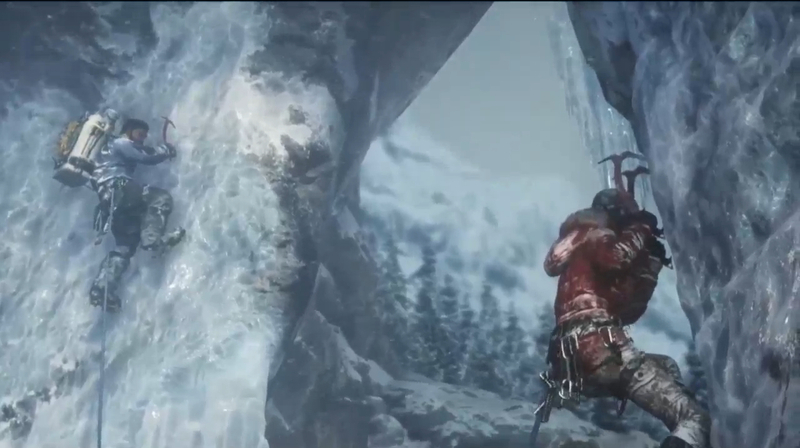 Square Enix and Microsoft just showed off more of Rise of the Tomb Raider, the sequel to the critically praised 2013 series reboot of Lara Croft. The previous game gave us a more modern, realistic, and emotional younger Lara Croft, and the sequel continues the origin story about how she became the swaggering Tomb Raider. During its Electronic Entertainment Expo (E3) press briefing today, Microsoft and Tomb Raider developer Crystal Dynamics showed more the game which will launch exclusively on Xbox One in the holiday season of 2015. The game was playable on stage. The demo started with Lara and another companion on a snowy mountain ledge path in what looks like the Himilayas. She climbs with ice picks up an ice cliff. She nearly falls, and picks her way to the top. From there, she sees a Tibetan mountain temple in the distance. Then she has to run for it to escape an avalanche of snow and ice. Somehow she makes it back to the mountain path, and she has to run along it as it collapses. Square Enix was initially underwhelmed with sales of the reboot title in 2013. But a rerelease of a next-generation version on Xbox One and PlayStation 4 helped it take off and hit 6 million copies sold (as of March 31). By getting a timed exclusivity for the Xbox One, Microsoft is betting that Lara Croft will help it sell more game consoles. In the last game, Lara was emotionally and physically battered, and she proved she was a survivor and, later, a maniacal killer of bad guys.